MillieSoft are pleased to introduce the latest application for windows media center – My Media Center. It's primarily a child friendly interface for media center that parents can use to control what content the children can see. Have you been terrified that your toddler is about to pick up the remote and start watching the latest episode of Doctor Who? Are your kids frustrated with having to remember if something is in Recorded TV, Videos and DVDs? Are you fed up with your remote-happy kids deleting their favourite program? Do you want to set up a whole hour's of TV without constantly having to come back and pick the next program? Then this is the add-in for you. The settings are all PIN protected so the kids can't change them, and you can launch straight in to My Media Center, bypassing the other screens. Plus there's a funky animated front end that should make it a real hit. Download now from here. 1. Is there a Vista version? 2. Is there an XP version? 3. Why is the wrong logo shown for my TV Channel? I don't have global information about channels and logos for all TV channels globally, so I have to do some guesswork. I get notified when someone adds a channel with an unrecognized call sign, and I do my best to google the right logo for it. I'm bound to get it wrong sometimes since different countries have similarly named channels. If I have got the wrong channel logo, put a post on the forum with the name of the channel that you see on the screen and a link to the TV station web site. 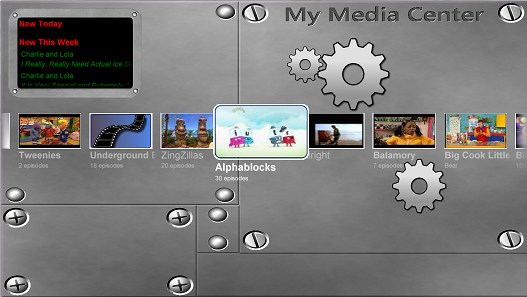 My Media Center is a Windows 7 Media Center interface specially designed for kids. It has a simple easy to use interface, and it allows a you to set up filters on what can be watched so that your youngsters don't accidentally start watching age inappropriate programs. NOTE – when upgrading to 2 or later from 1.2 or before, the auto-upgrade will error. Sorry. Uninstall the old version then install the new version.